It’s often said design is a dialogue between designer and user. We talk to users about what they want and need. We discuss projects with our colleagues to examine problems and uncover solutions. Conversation is such a great way of achieving clarity of thought, even if you’re just talking to yourself. But conversation only really begins when a user gets involved. We make things, put them out there, and wait to see how the world responds. Conversation is growing increasingly relevant to digital product design in a more literal sense. Our interactions with computers have always been fundamentally rooted in input/output, call and response. But as computers have grown increasingly sophisticated, so too has their ability to communicate in a more human way. Conversing with a computer has long been a trope of sci-fi, and a goal of many researchers. The reality of how this is actually playing out differs slightly from the predictions of the past. But it has arrived. Conversation has become a user interface. Given so much of our work is based on the back and forth exchange of ideas, it’s not surprising designers are imagining a new generation of messaging products, with dialogue at their center. Conversational UIs are breaking out of messaging apps and into products we use every day. We’re innately tuned to converse with others. It’s how we share knowledge, how we organise ourselves, and how we share emotions. Language has been part of our makeup for hundreds of thousands of years. So of course we message all day long in bursts and binges, with family, friends, and colleagues. Messaging has become a layer through which daily lives are conducted. Think about it: how long did it take this morning before you sent or received a message on your phone? Look at the list of the most popular apps in the world: of the top 10, all are social in nature, and 6 are primarily for messaging. The history of personal computing is best described as the continual removal of layers of abstraction between machines and people; the progression from inscrutable punch cards, to arcane command line, to mouse pointer to multitouch. In each change, the interface became less couched in the native language of the machine and more accessible to the human using it. The next step is for machines to extend and adapt themselves to how we naturally communicate. Conversational interfaces have created a whole new set of opportunities and challenges for designers. What if we could build products that facilitate conversations not just between two people, but between a person and a service? I’ve written before about this new breed of app, but it’s interesting to unpack how some of them work. Concierge services like Path Talk and Magic promise to answer your questions and deliver just about anything to your door, all via text message. How they do it is actually a little deflating: they have banks of support agents who read incoming messages, fulfill each request manually, and then type out replies. This is the Mechanical Turk approach to software, the wizard behind the curtain in The Wizard of Oz. It’s capital intensive, scales poorly and arguably only redistributes the work, creating low-value jobs for the human agents. Others like Facebook M and Operator have plans for a less manual approach, using artificial intelligence to answer questions. Using these apps, you’re no longer messaging with a headset-clad human, but with a bot. At its simplest, a bot is a piece of software that runs inside a messaging app that can perform basic tasks. It’s like Siri, if Siri were a friend in your contact list you could text. So you can send a message to a bot, and it can send you a reply. But it can also perform tasks for you. Let’s say you needed a taxi. Just text the bot that sits inside your messaging app, and it will take care of the rest. Part of their appeal is that you can easily build your own. Bots are straightforward to write — often just a simple script — and can be integrated into existing messaging apps. Just like that, you have the opportunity to build something new, right where the action is; inside the messaging apps people are using all day, every day. It means you can replace many of today’s disjointed app experiences with something simple and integrated. Developers have already written hundreds of bots for Slack, Telegram, Twitter, and Facebook Messenger. Suddenly we are marching headlong into new territory. What we’re witnessing is the emergence of a brand new platform, on which we can build new user experiences. These changes happen very rarely and as with any platform change, almost everything is up for grabs. A similar transformation is happening today. Bots are to modern messaging apps what APIs were to Web 2.0; a way to build on top of other services, experiment, and create a new way of interacting with existing services. It’s the start of a significant new way of interacting with computers. This leaves us with a whole set of open questions. What role does design have to play here? What does it mean to design one of these bot experiences? 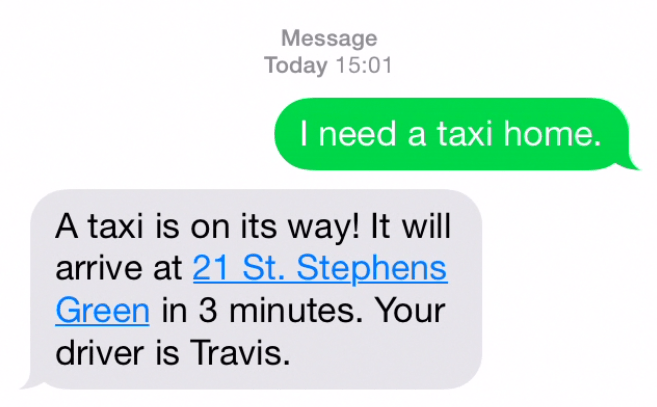 Is conversation user experience the next frontier? What might a conversation designer produce? I like to think about design as an ongoing dialogue with the past. Design is about drawing connections between disparate subjects. The best designers I have encountered possess an innate ability to filter and synthesise what they have learned in the past to achieve some insight about the future. With that in mind, what inspiration can we draw from the past that might help us to think about designing Conversational UIs? Well, linguists have certainly thought a lot about conversations. Here’s a sentence diagram; something linguists use to map sentences and break them down into their structural components, verb, subject, object, and so on. Think of it like musical notation for words. Each sentence has its own whole architecture, its own meaning and structure. Now zoom out to consider a conversation constructed of multiple sentences. Mapping that is a different proposition entirely. It could branch and flow in all kinds of directions. How might we do that? A big part of my childhood was the Choose Your Own Adventure books; interactive fiction where the reader chooses their own path through the story. Some readers produced intricate maps that laid out all of the branching possibilities through the game. How might this be represented as a UI? 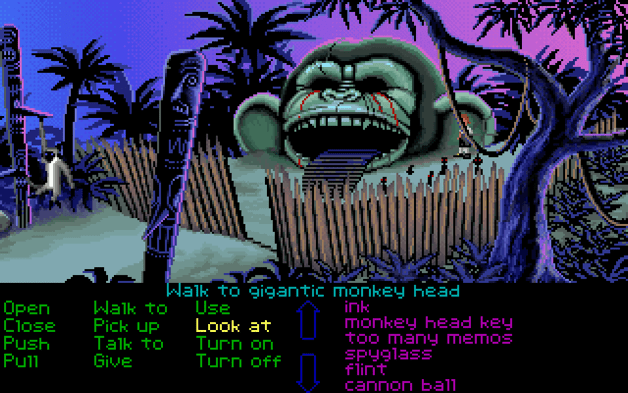 Early text adventure games like Colossal Cave Adventure or 1990s click-and-point adventure games like The Secret of Monkey Island used conversation as a core interaction paradigm. Basic commands drove much of these games’ interactivity, and branching conversation trees provided the engine for dialogue. What’s interesting about all of these examples is that they are all essentially chat bots. They are simulated conversations with a computer or system designed to feel like normal conversation. But in doing so they actually facilitate entirely new types of interactions. So what design lessons are to be taken from the questionably-spent days of my youth, reading nerdy books and playing video games? Interesting as they are, they don’t provide a shrink-wrapped solution that can be applied to bot messaging. What they do provide is a starting point. Conversational interfaces aren’t starting with a blank page. As designers, we can take these examples and use them as a starting point for investigation. In a future post I’ll detail how we’ve been doing just that to build some exciting new additions to our Messenger product.